It is with great sadness that we share the passing of Norb Brylski, a central subject of our 2009 film Typeface. Norb passed away on Monday, January 22, 2018 at the age of 94. 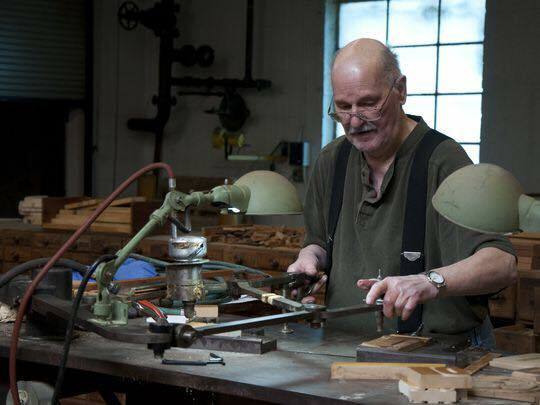 After serving in the Army Signal Corps during World War II in England and Norway, Norb returned home to Wisconsin and began a printing apprenticeship at the Franciscan Monastery in Pulaski and eventually opened his own print shop. When the print shop proved less than lucrative, he took his printing knowledge with him to the Hamilton Mfg Co. in Two Rivers where he worked in the wood type shop the entirety of his Hamilton career, before transitioning into one of the best loved volunteers at the new Hamilton Wood Type & Printing Museum. Norb was beloved by the filmmakers and other subjects of Typeface, many of whom still cherish wooden letters cut by Norb himself. On his passing, director/producer Justine Nagan wrote, "It's with great sadness, and love, that we share the news of Norb Brylski's passing. Norb was a central subject, (many would say the star), of Typeface and a friend to all in the type world. He was 94 years old. Here's to the great pantograph in the sky." Typeface is available to download on Amazon, VHX, iTunes and for purchase on DVD.